If we are out of stock of the size/colour you are after, please email us and we'll send an alert when they arrive in store. Seamless socks with no shaped heel perfect for children experiencing sensory processing disorder, hypersensitivity or who simply can't stand annoying seams. SmartKnitKIDS Seamless Sensitivity Socks are completely free of seams. The patented product is knit like a cocoon, starting from the toe and working up to the ankle, providing comfort and relief to children of all ages. The design without a shaped heel allows children to put on socks with confidence and keeps little feet from outgrowing their socks so quickly. SIZE SELECTION GUIDE: As the socks have no shaped heel, the sizing is very flexible and the child’s shoe size determines where the sock falls on the leg (ankle, crew or knee-high). 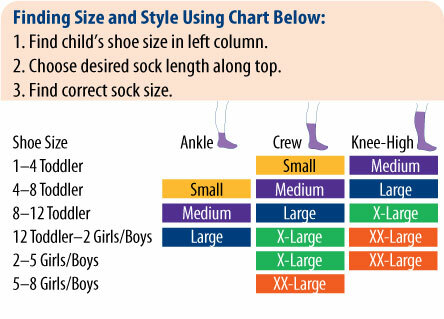 For example, using the sizing chart below, if your child wears a size 3 shoe (girls/boys) and you want the socks to be crew length, you would need X-Large. Other sizes will still fit but will sit either higher or lower on the leg. If you are still unsure about sizing, measure your child's foot from the tip of the big toe, across the top of the foot and up the leg to where you want the sock to sit. Select your preferred size according to the length shown next to each sizing option in the drop down menu above. My boys with sensory issues / autism love these seamless sensitivity socks. For my 5 and 7 year old I got the XL. For my 10 year old the XXL and they are the right sizes. They save us 5 minutes AND a lot of whinging every single morning. Highly recommend. Hi I purchase a pair of soxs for my 7 year old granddaughter I took the measurements following the chart ect. which I found a bit confusing and they are a tad to small, but in saying this she loves them and considering she was having a melt down every morning because of the toe seam it was still a win situation. Because of the price I can only afford one pair but we are extreamly happy with them. My son has ASD and was hoping the seamless socks would help his sensory issues with socks. And whilst they dont have the seam to connect the toes to the rest of the sock, the design (which I am not sure how to fix I admit) of the knitted whole sock creates two small 'knots'/ harder lumps at the end of the knit right on the edges of the toes which is constantly in contact with the shoe, the part of his normal socks which gives him the most trouble. Message from Siri @ It Makes Sense: Sorry the socks haven't helped in this instance. It may be worth trying a different size - as you progress through the sizes, they become a little wider and longer, so you might find a different fit makes a big difference to their comfort. My daughter loves these socks. Seams on other socks annoyed her under her foot but we don't have this issue with these socks. Best purchase I've made as it makes my mornings before school so much less stressful. These are brilliant socks that do everything that they are advertised to do. No seam, wear well and keep peace in our household. Yes they are more expensive than normal socks but worth every last cent as my daughter will wear them without any drama. Great customer service. Thank you. We have been buying these socks for a few years now and yes they changed our life. My 8 year old daughter is highly sensitive to seams and tags and we had the tears and tantrums every morning when trying to get ready. These socks have fixed everything. Yes they are expensive but worth every last cent for my sanity and helping us to get out of the house in the mornings. They wear, wash and last well. No more melt downs over socks! Can't get my daughter to wear anything else. Shame about the roll top - she's forever pulling them up, but I get why it is there. Very expensive, when I lived in the UK I thought I was paying a lot @ £2.50! But I understand that too, everything is expensive here! Otherwise, great socks. No More Meltdowns before Leaving the House. My son has had issues with normal socks his whole life. I used to dread getting him ready to leave the house as he would have intense meltdowns relating to his socks and how they felt to him. I'm talking about ones that would go on for an hour or more, every time we left the house. I have been getting his socks from It Makes Sense now for the past three years. This has been life changing for him and our family. I highly recommend them for any children with sensory issues. No more arguing in the morning! My Miss 5 was having a hard time with her socks every morning before school. 20-30 min or screaming and crying - not fun. Once we got our socks there is no screaming! Yay! I would highly recommend the socks though! Click the button below to add the SmartKnitKIDS Seamless Sensitivity Socks to your wish list.